Yesterday I met up with my friend Kevin so we could visit a few pictograph panels in the San Rafael Swell. I had searched for these same panels last month and not found them, but this time I found each site I was looking for, and more! The main site we both wanted to visit was the High Alcove Site which contains this very unique red-painted anthropomorph with scratched designs down it’s torso. 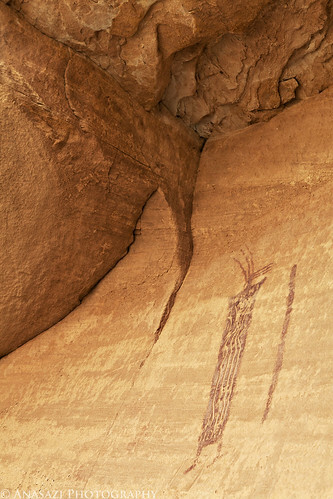 This figure is located high on the canyon wall underneath a small arched alcove, which frames the site nicely.